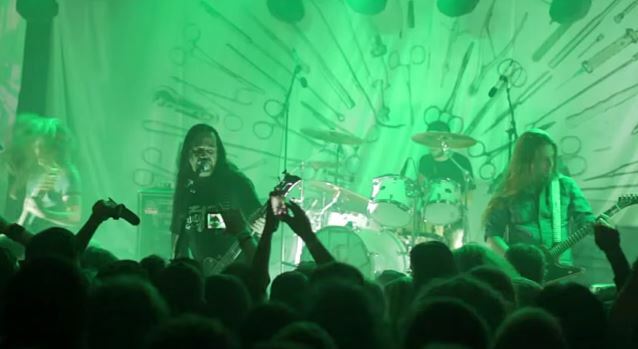 Fan-filmed video footage of CARCASS' entire November 5 performance at The Broadberry in Richmond, Virginia can be seen below. CARCASS will issue a collection of previously unreleased and hard-to-find tracks this November. Titled "Surgical Remission / Surplus Steel", all the songs on the EP were recorded during the sessions for "Surgical Steel", which was produced by Colin Richardson (NAPALM DEATH, BOLT THROWER, GOREFEST, CANNIBAL CORPSE, SINISTER, RODRIGO Y GABRIELA) and mixed/mastered by Andy Sneap (MEGADETH, ACCEPT, EXODUS, TESTAMENT). "Surgical Remission / Surplus Steel" will be made available on physical and digital formats on November 11 (North America), November 17 (UK) and November 14 (rest of Europe) via Nuclear Blast. 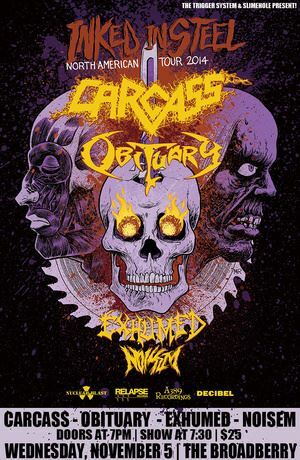 Joining bassist/vocalist Jeff Walker and guitarist Bill Steer in CARCASS' current incarnation are drummer Daniel Wilding (ABORTED, TRIGGER THE BLOODSHED) and guitarist Ben Ash (PIG IRON, DESOLATION, LIQUEFIED SKELETON). "Surgical Steel" sold around 8,500 copies in the United States in its first week of release to debut at position No. 41 on The Billboard 200 chart. The CD was released on September 16, 2013 in the U.K., September 13, 2013 in the rest of Europe and September 17, 2013 in North America via Nuclear Blast Records.